Senator Dille's top legislative priority is about to happen and the DFL will tax it to make Minnesota better. The plan is crystal clear now. Dille, as he has stated publicly in numerous forums across the Senate District, wants to ensure that every Minnesotan is a happily married millionaire. 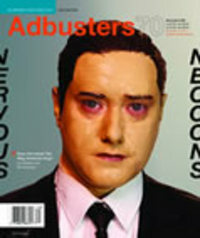 I don't subscribe, but I am a sucker for Adbusters magazine when I see it. Because I am in mortal danger of adding three books to my unread pile every time I enter a bookstore, I'd planted myself at the magazine section while my domestic partner browsed. Before she was through, I'd read so much of the current issue I was obligated to buy it. "You can't stop terrorism with guns, because it is in the mind. Terrorism is created by a strong feeling of injustice, political or economic. I believe putting resources into improving the lives of poor people is a better strategy than spending it on guns." "Charity is not a healthy basis for a relationship between people. If you want to solve poverty, you have to put people in a position to build their own life. Western governments and development organizations think they need to offer permanent charity. As a result, they keep entire economies in poverty and families in an inhuman situation." The Minnesota Senate tax plan tracks very closely with the revenue strategy proposed by Growth & Justice last year — raise more money and make the overall system more fair, which means a higher income tax rate for the very top earners. The proposal adopted yesterday by the Senate Tax Committee also would fund access to public or private preschool programs, which follows another G&J recommendation made two years ago in its Workforce First report. The Tax Committee hearing yesterday immediately followed a meeting in which the DFL Senate caucus considered which tax strategy to support, a new tax rate for high earners or a more general income tax increase. As they filed into committee, members were tight-lipped when approached for some indication of their decision. Then Sen. Majority Leader Larry Pogemiller walked directly to Growth & Justice executive director Joel Kramer, who was there to testify, and whispered in his ear. Now the howling can begin in earnest. Riding a mountain bike is not the same as mountain biking. I guess that should be obvious, but it takes mountains to bring home the point conclusively. We have a 20-year-old Specialized Stumpjumper that never got tested in Minnesota by more than wintry roads. Now it is in Colorado, where the bike is adequate, but the biker is sorely tested. Mark Twain called golf a good walk spoiled. It is only spoiled if you go out there not knowing what you're doing, which covers a high percentage of American males. I find mountain biking has similar properties for a 58-year-old novice, except the spoilage options are far more diverse — not to mention attention-getting. After the ride I took this afternoon, I would call mountain biking a vigorous retreat, with cannon. So far, I have learned that it is better to be bold. As with downhill skiing, physics is generally your friend, and it is better to stay in motion, provided you can point that motion in the right direction. Stopping, which on flat land is a safe reaction, means you are at risk of falling — and your landing options are scrubby dried brush, cactus or rocks, with the occasional cliff thrown in for special interest. Or you are at risk of walking, pushing a 20-year-old bike. I headed upward today over rocky and precipitous terrain, pedaling when I could, walking when I couldn't. (Add heart attack to the above list of risks.) But I consoled myself with the idea that I had mastered enough skills to enjoy the long, twisting descent. "Runaway Spending" is One Way to Explain a Deficit. The trouble with reading conservative blogs is you can get caught up in wanting to correct the spin, the errors and the outright prevarications — many of which are indistinguishable to the casual reader. When Gov. Pawlenty was first elected, he inherited a $4.5 billion deficit, which was the result of runaway spending increases. Now look at this chart, which shows state and local government spending as a percent of Minnesotans' personal income. Click, if you need to, to see the dramatic drop in revenue from 1998-99, before Pawlenty took office. As you may remember, the state was running a budget surplus at the time of predecessor Jesse Ventura's election. Ventura, the last comedian to beat Norm Coleman, believed the money should go back to the taxpayers. I suppose "runaway spending increases" is one way to describe what caused the deficit. Another explanation might be "normal spending increases following expedient tax cuts," but that doesn't flow as well. You can look at the state spending history dating back to 1960 and judge for yourself. Most people won't, of course, so the distortions stand — and gain credence through both mindless and mindful repetition. I See the Light Come Shining, From the ... Right? Because I am most likely to be carping at conservative blindness, it may surprise you that nothing gives me greater pleasure in writing this blog than to agree with a conservative. Across the Great Divide is not just a catchy title; it expresses a real desire. The pleasure comes, of course, from seeing someone come into the light. My light. But in the latest case, it is progressives who are blind, and at the risk of becoming an ALL CAPS SCREAMING HEADLINE on a certain blog, I will tell you why. Too many progressives have a reflexive suspicion of business. It's not altogether unwarranted, but I prefer to indict corporations as I do people — as individuals, not as a class. Since business escapes sanctions it really deserves, the unspoken rationale goes, it should carry more of the tax burden as a kind of moral levy. One of the main reasons the tax incidence of lower-income Minnesotans is greater than others is our dependence on business taxes. The Department of Revenue’s study shows that taxes initially imposed on businesses are shifted forward to households, primarily through higher prices and lower wages, which fall more heavily on lower income households. Business taxes shifted to the $17,000 to $23,000 income households take 2.6 percent of their income, while those shifted to the $105,000 and up income households take only 1.2 percent. In fact, if state and local business taxes were cut in half, the “unfairness” would disappear. The $17,000 to $23,000 income group would pay 9.2 percent of their income in taxes, while the over $105,000 income group would pay 10.2 percent. I haven't analyzed this independently, and the author is really arguing for keeping government revenues the same, but that isn't my point today. We should be able to have a discussion about this kind of idea. But it can only happen if we leave off our blinders. If Your Wife Dies After Eating a Woman's Marmalade, Don't Marry Her! To Minnesotans of a younger vintage, the name Marjorie Congdon Hagen may mean nothing. But if she were in her prime today, she'd be top of the hour Foxfodder. This is a precise summary of a life that advantages could not salvage. Majorie Mannering Congdon LeRoy Caldwell Hagen went through a few husbands, houses and prison sentences, and dodged a number of apparent murder raps, but is still wanted in North Dakota for bigamy. Looks like Pima County, Arizona, gets her first. UPDATE: The name Marjorie Congdon Haden meant nothing to people who remembered her name was Hagen... corrected now. Thanks for Raising the Average! This updates a constant theme here pretty well. Income inequality grew significantly in 2005, with the top 1 percent of Americans — those with incomes that year of more than $348,000 — receiving their largest share of national income since 1928. The top 10 percent, roughly those earning more than $100,000, also reached a level of income share not seen since before the Depression. share of national income since 1928, analysis of newly released tax data shows. We are beginning to see some of these consequences played out in Minnesota as tax proposals creep and dodge through the legislature. Republicans are screaming and finger-pointing. "Spending spree!" "Job killer!" "The rich will leave the state!" "Class warfare!!!" The economy is doing great, if you're near the top. It's even doing all right on average. But as the data show, the growth isn't making it to the average, the median, or most of the remaining 90 percent. Click on the Times graphic with the article to see the timescale of changes. The long period of prosperity when income growth for the bottom 90 percent did a bit better than the top 1 percent lasted from post-WWII to about 1985. Over the last three years, the top 0.01 percent did substantially better than the top 1 percent. In a related story, Minnesota's income growth for 2005 ranked 46th in the U.S. I've written before about how we shouldn't get too excited about these comparative rankings or year-by-year changes. Louisiana, for example, had strong per-capita income growth because it lost a lot of poor residents thanks to Hurricane Katrina. Income growth has been strong in Wyoming because of an oil and gas boom has suddenly brought a lot of relatively high-paying jobs to a state without much of an economic base. What's important are the trends. Still, there are troubling trends in areas that represent leading economic indicators, such as educational attainment, health access and congestion. These are heading in the wrong direction. A lot of the battle over taxes this year is really a battle over what action to take to arrest the trends. We may not have all the answers, but under the Pawlenty and Ventura tax cuts, the trends have gotten worse, not better. Unless you're at the top. Profile of a Tax Cheat. Newspapers are starting to search out new angles for tax season. Or more accurately, dig up stories they did a few years ago. With income tax bills percolating at the legislature, there's more stimulus than usual to write about tax issues. So what am I doing? 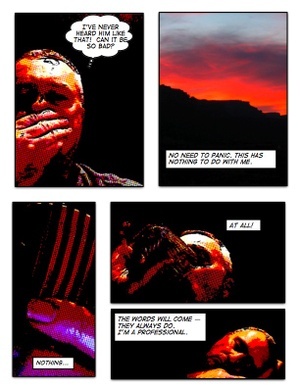 Playing with the Comic Life application that came with my new Mac. This will do for making comics what Blogger and Typepad did for blogging, which could be seen as good or bad. Here's an early page from my first comic in progress: The Shaper. The Pittsburgh Post-Gazette reported on a year-old study on tax cheating conducted by some professors at Youngstown State University. Not too astonishingly, it determined that the profile of the typical tax cheat was a high-tax-bracket male, under 50, with a complex return, who was easily able to pay the correct amount. Based on 2001 returns, the IRS estimated underpayments on federal taxes of $290 billion. This seems to confirm that the most cost-effective way to recover money is to audit more high dollar returns. Of course, those are precisely the returns that have received less scrutiny under the Bush Administration. The pressure to cheat, [study co-author Dr. Joe] Antenucci said, comes from the big payoff. "The top tax rate is 35 percent. In this investment environment, people scratch to make a 5 percent to 8 percent return, and there is 35 percent sitting right there." Self-employed people who deal largely in cash also have the opportunity to short the tax man, but if we collect every last dollar from house cleaners, hair stylists and cab drivers, it will take a lot more enforcement to recapture relatively little revenue. Another interesting finding: That overstating charitable contributions — especially church donations — is the most common way to cheat. And finally, cheats justify their behavior with excuses that sound very much like those of the anti-tax crowd: the system is unfair and the government is wasteful, so they are simply righting a wrong by cheating. When Do We Start Sweating Climate Change? To run for office in Minnesota, you gotta know ethanol. In Colorado, you're DOA unless you understand water rights, which are considerably more important and complex. This week, the Colorado River Water Conservation District officials said water shortages caused by "regional climate change" could affect every water user in the basin. Stream flows are declining. Flows into Lake Powell, essentially the watershed's lock box for paying off calls on downstream water rights, are expected to be 59 percent of normal — the seventh year out of eight with below-average in-flow. Colorado, Utah and Wyoming might have to cut back on their water use if the reservoirs can't deliver what's owed to Arizona, Nevada and California. Meanwhile, there's a lot of energy production upstream that is very thirsty, with water rights that supercede those of more recent immigrants to the West. Growing up, my hometown had an expression: "Be sure to flush. Rifle [a town downriver with notoriously vile water] needs the water." It's not so funny any more. The New York Times reports that the cool alpine towns high above the Arizona desert are starting to break down. Trees are dying and fires are more prevalent and destructive. “The West has warmed more than any other place in the United States outside Alaska,” said Jonathan T. Overpeck, a University of Arizona scientist and co-author of the recent draft by the Intergovernmental Panel on Climate Change, released last month in Paris. A trip up to any one of the 27 sky islands shows the ravages of heat on the land. The forests are splotched with a rusty tinge, as trees die from beetle infestation. Frogs with a 10,000-year-old pedigree have all but disappeared. One of the sky islands is the world’s only habitat for the Mount Graham red squirrel, an endangered species down to its last 100 or so animals. For the squirrel, the frog and other species that have retreated ever higher, there may be no place left to go. “As the climate warms, these species on top of the sky islands are literally getting pushed off into space,” Dr. Overpeck said. The Star Tribune's story on the Minnesota House DFL's proposed property tax relief plan, is accompanied by an instant poll that is "intended as entertainment. They are not considered to be true measurements of public opinion." Maybe. But why doesn't anyone ever propose cutting wasteful spending first? Nice how they throw in the "wasteful spending" curve ball, making the poll veer off into Big Question comment territory. [Recently, the Big Q gamely tried to suggest that "trolls and sock puppets" take their act elsewhere, with little observable effect on thread discourse.] Everyone's in favor of cutting wasteful spending, guys. The problem is sorting the pork from the sacred cows. To make the poll even more entertaining, why not include other "choices." Maybe. But why is Al Franken so angry? Maybe. But what are we doing about Muslim cab drivers? Maybe. But why are we funding stadiums for billionaires? Maybe. But why is the Secretary of State a communist? Maybe. I don't care, because I'm moving to Florida. Or you could just go vote anyway. Is it Getting Warmer in Here, or is it Just Me? For some, melting polar ice caps may not provide unimpeachable proof of global warming. Nor will an 80-degree March day in Minnesota. Even the accumulation of effects can be ignored by those so inclined. But a list of them would be downright depressing, even for the deniers. Yesterday I read the observations of a University of Colorado biologist who described how cottonwoods are budding earlier, and how the change has forced naturalists to move their field trips from the first Saturday in May to early April. Maybe these kind of observable local examples will help turn the tide of public opinion. One of my old posts that gets a surprising number of hits is about possums moving north. Reliving high school days is not my thing. My three full-time years in this town were good ones, but coming back to live in a place I left more or less for good 40 years ago should let me start fresh, without starting from scratch. In addition to family, I've run into a few classmates, one of my former coaches doesn't have to pretend to remember me, and though I haven't seen them for a few years, my two best friends from those days still live here. But this morning, I wonder about one who just died here. The funeral notice was just that — three lines in Friday's paper, announcing a service at the cemetery the same day. Dale died four days earlier at the VA hospital. Survivors include one brother and one sister. And that was it; nothing in the other days' papers. Once upon a time, he was co-captain of the football team. He and his girlfriend were elected Tiger Annual Royalty, which meant they were selected for formal portraits and a photo spread that was supposed to show how seniors displayed "True Tiger Spirit." There they are, playing cards, fixing Dale's scooter, horsing around in yard, getting ready to head for the hills in an open jeep with Dale's .22. The idealized couple, the ones we wanted our parents to imagine we were, while we were getting drunk in a canyon or making out in a car on some canal road. Thinking back, Dale was a quiet, modest guy with a sweet girl. Maybe that's why we liked him. But the VA? A graveside send-off without so much as a job, kid or an ex-wife mentioned? It's time to make a few of those calls I've been putting off.